Arlington Public Library What to Read: Can't find what you're looking for? No Problem! If you can't find the book, movie, music CD, or article you want at the Arlington Public Library, there is still hope! 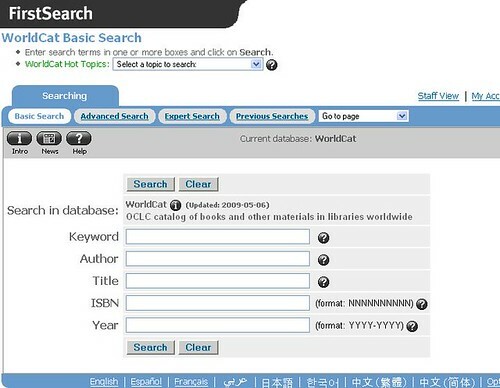 Try using our Interlibrary Loan service by searching WorldCat for what you need. WorldCat pulls together items from over 10,000 libraries across the country. You are bound to find what you need in this extensive catalogue. Searching is pretty easy and, once you've found an item, you can click on the title to get a wealth of information about it. You can also see which libraries have the item by clicking "Libraries worldwide that own item." Pretty simple, really. There is a fee of $2.00 for each item you order through the Interlibrary Loan service, but that's a much better deal than what you might end up spending at the bookstore for an item you don't necessarily want to own. For more information on our Interlibrary Loan policy, please click here.